After long await it is finally here. I have followed this one for a while but have been remiss in my postings. 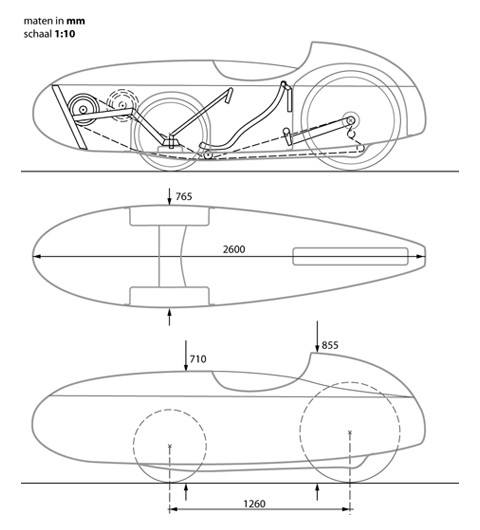 This is a new velomobile by the good people that bring us the Quest. So here it is... just a bit smaller. Instead of hearing me rant, I have posted the specs and the features below. The QuestXS comes ready-to-ride, including light system, bike copmuter, bell, air pump, spare tyre and tyre repair set. *The QuestXS has a polyester coating sprayed in the moulds while producing the shells. Under the finish there is a black and white layer to make it non-trasparant and even. Because the layers are as thin as possible the colours will not exacly match RAL colours, but yellow comes close to RAL 1023, red RAL 3020, blue RAL 5015, orange RAL 2004, green RAL 6018 end black RAL 9127. Spraying afterward in any carpaint is also possible at extra cost, as from € 750.